UCLH is one of the largest NHS trusts in the UK working across six hospitals. The Trust wanted to find an efficient way to display up to date information to their patients, replacing posters and noticeboards which have become increasingly outdated. The aim was to communicate key patient information messages, positive Trust messages, waiting time information, keeping patients, visitors and staff up to date with clear, consistent and timely information. It is common knowledge that A&E services are under increasing pressure. We use digital signage in our department to inform patients where they can access self-care information and advice before coming to A&E. The messages really help patients understand that we’re always here in a emergency but not every case is an emergency and when speaking to various patients in our department, they would definitely rethink who they should contact the next time they feel unwell. 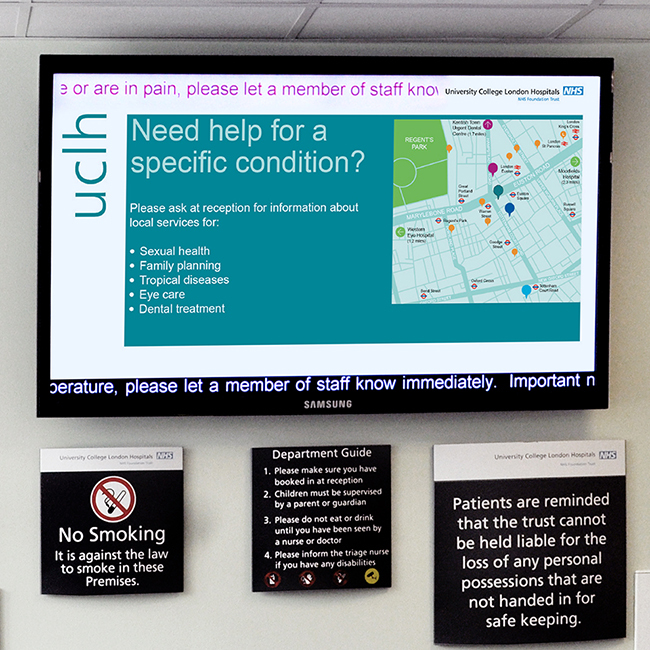 In 2011 we began installing professional high definition digital screens to display important healthcare information. 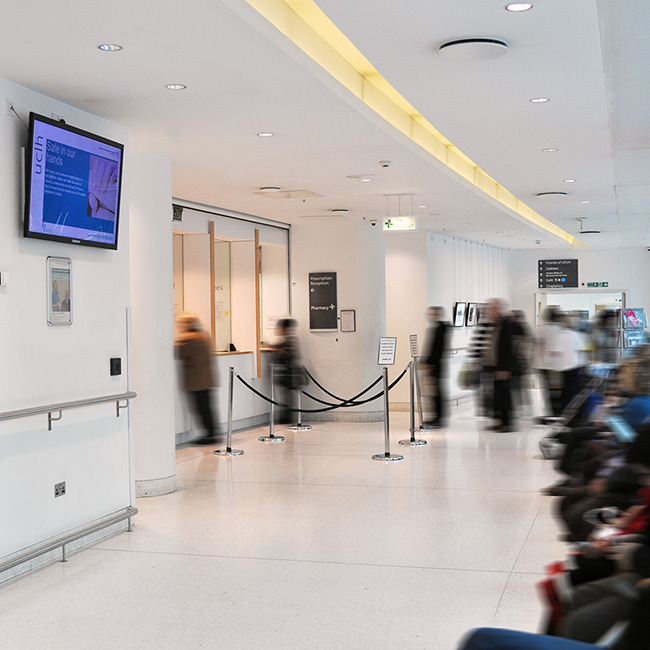 THMG worked closely with the Trust’s communication department to develop dynamic relevant messaging within the hospital’s brand style ensuring that only approved messaging appeared on the screens. Post-launch, the Trust implemented new screens A&E, Antenatal, Pharmacy and Xray. The software on the screens allows staff on each department or ward to update the screen with up to the minute data (e.g. waiting times, staffing ratios or results from Friends and Family tests) ensuring that patients remain aware of the department’s performance and how it varies from month to month. 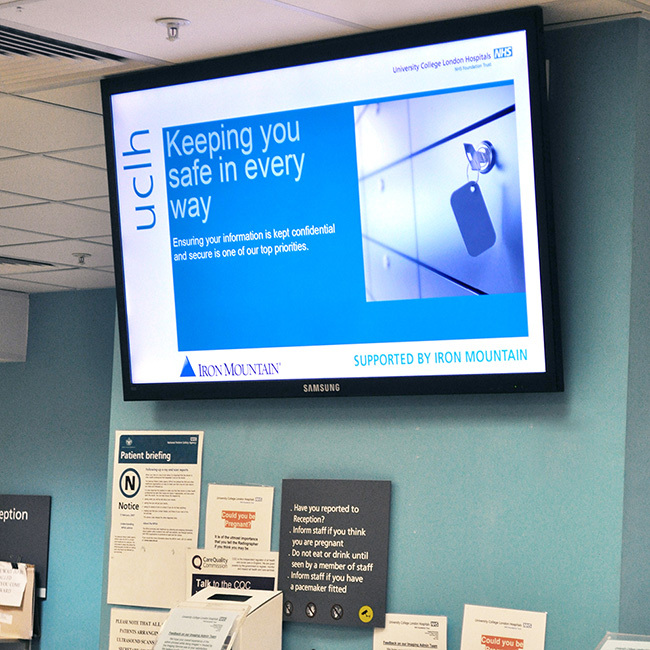 Since 2011 UCLH now have over 15 digital signage screens across the Trust. The feedback from patients and staff has been extremely positive – 90% of patients surveyed said that the screens made them more aware of hospital services. Staff have noted efficiency savings due to the significant decrease in time taken to update screen data daily versus the whiteboards that were commonplace in these departments.